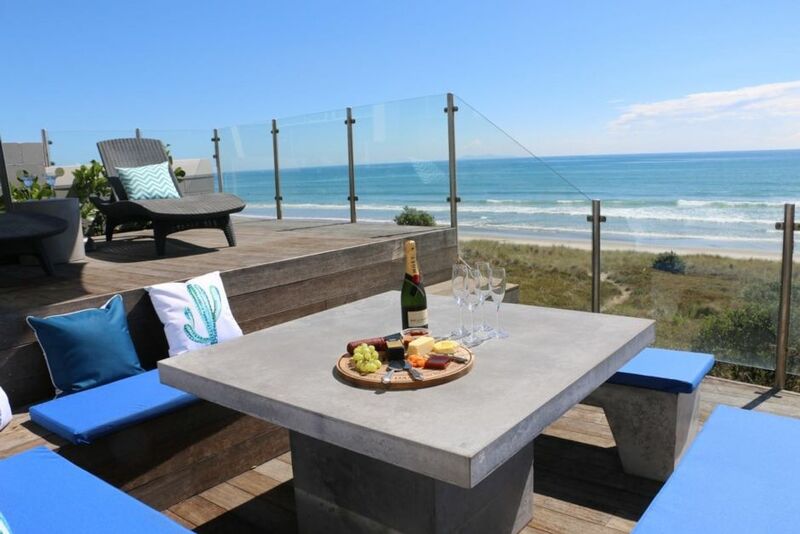 This luxury five bedroom, three bathroom home sits on a full sized section on Mount Maunganui's premium stretch of beachfront land between the end of Marine Parade and the Omanu Surf Club. It has spectacular panoramic views from both floors which span from the main Mount beach to Maketu. In this beautifully appointed home, you can enjoy the BBQ on the sheltered ocean side balcony for the summer months or the gas fire for the winter months. Set down a private driveway you can see the children run from the downstairs deck on to the beach and into the sea. The Omanu Surf Club and its swimming flags can be seen from the comfort of your lounge. The Omanu Surf Club, take-aways, bottle shop and dairy are a two minute walk away. A New World supermarket or the Bayfair shopping centre are all a short drive from the house. The Mount shops, harbour, port and hot pools are also a short drive from the property. Walking distance to the Mount Maunganui Golf Course. Other sports available in the area are cycling, indoor rock climbing, diving, jet boating, canoeing, kayaking (freshwater and saltwater), parasailing, black water rafting, white water rafting, windsurfing and kite surfing, surfing, sailing, scuba diving and water skiing. Please enquire about availability of internet access. Private: Set down a long driveway with only sand dunes between front of the section and the water. BOSE home theatre and easy to use wireless movable speaker. The house is stunning. We didn't want to leave. We stayed 4 nights of a month long holiday and felt we had a holiday within our holiday. The beach is beautiful and when we weren't outside walking the beach or on one of the 4 decks, we were sitting in front of the glass wall looking out at the ocean. The beds and linens are comfortable and so soft. The kitchen is very well stocked. Other than walking to the grocery store, we spent the 4 days just enjoying the house and view. Perfection! Awesome location and lovely house - we really enjoyed our stay. Amazing location, central to everything and right on the beach. A peaceful and private resort with all the creature comforts and close proximity to the mount should you want to shop, eat or just stock up on supplies! This house is heaven!!! We didnt want to leave. The location is excellent, close to everything you need. A very short drive to down town Mount Maunganui. Close to New World. Dairy and some takeaway shops 5 driveways down. Its on a busy but down a long driveway that makes you feel like your far away from the hussle and bussle. The house itself has everything you need esp. for a large group. So many spaces where you can relax, inside and out. The beds were great. HEAVAN! We didn’t want to leave.